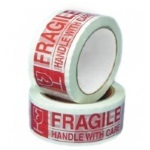 These security tapes with the label "FRAGILE - HANDLE WITH CARE" are a great way to inform others to handle a package with care.These fragile tapes have a 2.0 mil thickness which is for general purpose carton sealing. These tapes have a strong pressure-sensitive adhesive that will keep your packages securely closed. At Custom Printed Tape Supply we carry a wide variety of security tapes for your packaging needs.